German plug-in designers Cableguys have updated their Filtershaper VST plug-in to V2, improving many aspects of the software. In fact, it appearsevery criticism levelled at v1 in the SOS November 2008 review has been addressed and resolved. Filtershaper 2 allows the user to automate two filters simultaneously and independently of one another. The volume and pan setting of each filter can now be individually automated, as can the new master pan control. Each of the four LFOs have been updated, and can be set freely to any oscillation frequency between 0.02Hz and 5.24kHz, as well as sync’ed to the host tempo, at measures between 32 bars and 1/128th note. 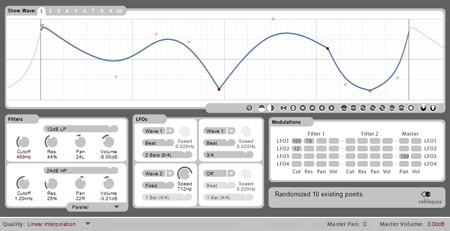 The user can also store up to 10 customised LFO waveforms, which can be drawn by hand into the top half of the interface. This section brings back memories of maths classes, resembling a sheet of graph paper! Filtershaper 2’s automation curve editor appears particularly accurate, allowing many different kinds of ‘break point’ (where the curve changes at a sharp right angle, for example), as well as smooth, high-resolution vector motion. A free demo can be downloaded from the web site, while the full version costs 49 Euros (or $69). Upgrades from Filtershaper v1 cost 20 Euros ($25). Cablebuys have also released similarly styled panning automation plug-in called PanCake, which is free to download.